with Leggatt Bros., London, from whom purchased on 28 September 1961 by the father of the present owner. 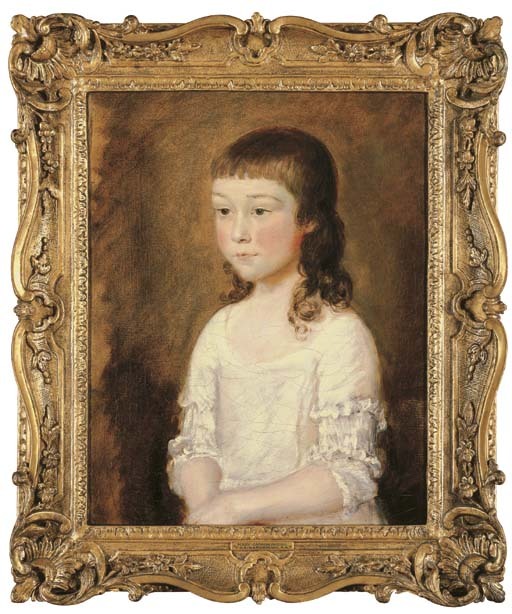 Probably datable to the late 1740s or early 1750s, when Gainsborough was back in his native Suffolk, the present work has traditionally been identified as a portrait of his youngest daughter, Mary. Although Mary, was born in 1748 and would have been a child at around the time that this picture was painted, the features do not correspond with known portraits of a slightly later date, such as The Artist's Daughters chasing a Butterfly of c.1756 and The Artist's Daughters teasing a cat of c.1758-1759 (both National Gallery, London). The unfinished nature of the portrait, with its sketchy background and loose-handling of paint, as well as its scale, suggest that it was not a commissioned work. It is likely to be an informal study of the child of a relative or friend. No early provenance has yet emerged to support an identification. However, very little documentation survives from Gainsborough's life and his early work is still a relatively unknown quantity. Writing about the portrait, Dr. John Hayes (private communication 19 September 2001), says on the basis of photographs, 'The portrait is indeed rather beautiful and, although I cannot find anything to compare it, I am convinced that it is by Gainsborough, but perhaps a little earlier than the familiar early paintings. There is no documentation of which I'm aware, and one wouldn't expect it: certainly the artist himself left no records'. On the basis of photographs, Hugh Belsey was uncertain of the attribution to the artist.